It’s the summer of 2018 and Tina found herself completely alone in the metal cage. Occasionally she’d hear loud noises scary noises and hear bigger dogs barking but everything was dark like it had been for some time. 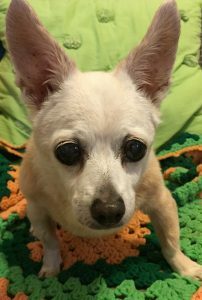 With age, Tina’s eyes have clouded over and her world has become darker. Her world became even darker and more confusing than it had ever been the day her lifelong companion of 15 years moved and left her behind. She was taken to ACCT by another family member who reported they couldn’t take care of “it”. At ACCT, Tina’s handleability upon intake was scored in the red meaning she was aggressive to staff. So Tina sat trembling in the cold cage for a week. Then Tina was “timestamped”. She needed to be pulled by a rescue before the end of the day or her time here on earth was up. Fifteen minutes before Tina’s timestamp was up, one of our volunteers saw her photo and fell in love and stepped up to foster. 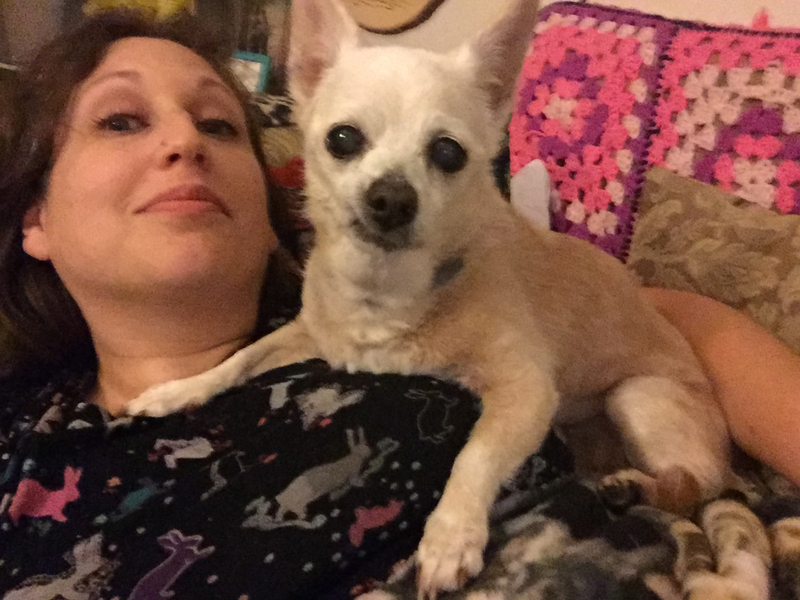 The volunteer, Rachel, said Tina looked like an old fennec fox which had grabbed her attention. Because she has arthritis and can’t see well, Tina needs assistance going up the steps after she spends time outside. Tina’s foster family has learned a way to approach Tina and pick her up that is the least stressful for her. Massaging Tina and then lifting her on the count of three works wonders. 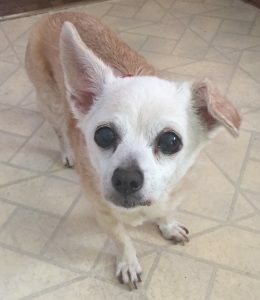 Sadly, not long after we saved Tina’s life, we found out she has chronic valve disease and is in congestive heart failure. 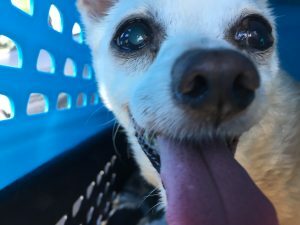 The vet prescribed a handful of pills for Tina’s heart, her allergies, and her arthritis. Dogs can live for several years in congestive heart failure if they are properly cared for and monitored by a vet. Our goal is to make the tiny woman happy and comfortable and let her know she is loved whiles she’s here with us. A few of Tina’s favorite things are soft blankets, her first romp of the morning in the grass, and mini treats! Tina has come a long way since her first day out of the shelter. 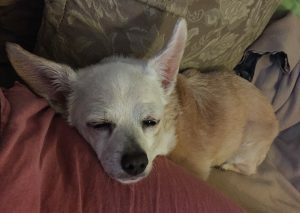 It seems she trusts her foster family and will sometimes happily lounge on the couch with them. Whenever Tina returns to her foster home after a car ride in her princess booster seat, she seems to know where she has arrived. She starts wagging her tail and once she gets inside she prances around doing a happy dance, pleased to finally be home again.